This is the average cost for this item in the Inventory Item file. This is the last cost for this item in the Inventory Item file. This is the standard cost for this item in the Inventory Item file. This will appear only if LIFO/FIFO costing is not being used. This is the average cost for this item in the Inventory Item file. This cost will appear in place of Std Cost if LIFO is the inventory costing method. This is the average cost for this item in the Inventory Item file. 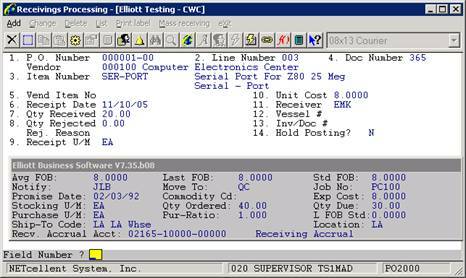 This cost will appear in place of Std Cost if FIFO is the inventory costing method. These are the initials of the individual within the company who should be notified in the event of problems with the receiving. This should be someone who can resolve price conflicts, for instance, or someone who has the authority to reject a shipment that arrives too early. This is the area to which the shipment should be moved after receipt. How this feature is utilized may be some what different at dif­ferent companies. It may repre­sent a physical area, a depart­ment, an individual or an in­ventory location for example. This is the number of the job for which that part of the shipment represented by this line item is intended. This is the date the merchandise was expected to arrive. It may be the original request date or a date proposed by the vendor as being more realistic. This is the item's commodity code. This is the line item's expected unit cost for the unit of measure in which the merchandise was ordered. This is the unit of measure in which the merchandise was ordered. This is the quantity that was ordered on the line item in the purchase unit of measure. This is the quantity that remains to be delivered. Over-shipments will be represented as negative quantities due. This is the purchase order's ship-to code. The ship-to description displays beside the code. This is the inventory location for which merchandise on the purchase order is intended. Enter the vendor number of the vendor whose orders are to be listed. The entry must be that of a vendor on file in the Vendor file. The vendor's name will display beside the entry. Enter the receiving's item number or press RETURN to skip to entry of the receiving's vendor item number. If you enter the item number, it must be that of an item on file in the Item file. The item's description will display beside the entry. If you enter the vendor item number it must be that of a vendor item number that is defined in the Item Vendor file. If the vendor item number is defined and if the item number that is associated with it is that of an item on file in the Item file, the entry will be accepted and the item number and item description will display.